A group has sent Nelson Mandela’s picture to space for a virtual reality film project entitled ‘Madiba Ascended’. Late former president Nelson Mandela has been sent to space – in the form of a picture which a group of University of Cape Town (UCT) students sent from Stellenbosch. The picture, which was successfully retrieved about a week ago more than 200 kilometres from where it first ascended, was sent in December 2018. The move forms part of a virtual film entitled Madiba Ascended , which is expected to be released soon. Zimbabwean-born filmmaker Munashe Nash Makado, who is studying towards an Honours degree in English Literature at UCT, was the brain behind the concept. He is directing the film. Speaking to News24, Makado said the film sought to celebrate the centenary of Madiba under the metaphor “ascension”. “I have always been interested in astronomy. When I was in varsity, I was part of the astronomy club. But the idea for this specific project came from different places. First of all, Nelson Mandela would have turned 100 last year. So I wanted to do something creative to celebrate his life and communicate the magnitude of his legacy to future generations,” Makado said. He added that he wanted to eradicate and dispel the notion that Madiba was a sell-out. Makado said he failed to understand why young people said that about Mandela. It prompted him to come up with the idea of the film. “The film involved sending Nelson Mandela’s picture to space and using the metaphor of ascension to communicate the magnitude of Tata Mandela’s legacy, and hopefully dispel, reject, and spurn the abominable notion currently circulating among some youth that a man who spent 27 years of his life in prison for South Africa’s liberation was somehow a sell-out,” the filmmaker said. Among those involved in the project were the film’s executive producer Ashley Ellis, supporting crew Mayuyuka Kaunda, Kelly Kotik and Mcebisi Sidlai, and technical consultant Clemence Padya. 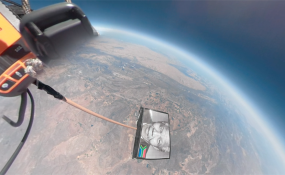 Makado said they used a weather helium balloon, a 360-degree virtual reality camera and Nelson Mandela’s picture. To track the package, a GPS device was used. To ensure that the camera’s power did not die during the journey, Makado said a power bank was attached. Calculations were made on the internet to predict the flight path and to get an idea of where the package would land. He said the package landed 80km north of Ceres in the Western Cape. “It went up to 80 000 feet, which is higher than most airplanes would usually go. You could see in the pictures the darkness of space,” Makado said. After picking up that the package had landed, the group drove to Ceres. However, they struggled to locate the package. “The first day we couldn’t find it. We went back for the second day and we also couldn’t find it and we just had to wait for about 30 days until the parachute sent its exact location back to us. Because the area that it landed was an obscure area so the parachute was moved by the wind,” he explained. While they were searching for the package, they met a farmer from the area. “We met this farmer, his name is Koos Mouton. He was just driving to his farm house and I got out of the car that we were driving and I spoke to him and told him I was making this film,” Makado said. He said he told Mouton about the project and the package and said it landed in the area but that they couldn’t trace it. “We left him with our contacts. So when I got the new GPS co-ordinates, 30 days after, I sent them to him and then he took his wife, his dogs and binoculars, and was like ‘Munashe, don’t worry. We are going to find this thing. I know this area,'” said Makado. A few minutes later, Mouton called and informed him that the package had been found. He arranged for it to be sent to the students. Some of the images are warped because the lenses of the virtual reality camera were 220 degrees wide. However, after editing, it would look normal, Makhado said. “Because it’s a 360-degree virtual reality film, within the film we are going to embed pictures and videos of Nelson Mandela’s moments in his life. In the background, you will be seeing this beautiful video of the 360-degree camera ascending into space,” he said. Makado said the film was expected to come out in a month’s time and would have screenings in Cape Town, Johannesburg and at the Berlinale film festival in Berlin. An exact release date will be announced on his Facebook page.